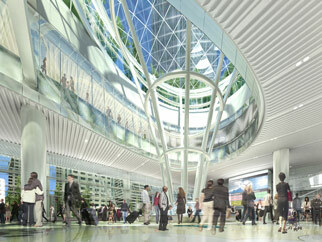 The ground level will serve as the primary circulation hub of the Transit Center. The ground level will feature a Grand Hall with a prominent Light Column allowing natural daylight into the building. The main entrance hall off Mission Square will include a public information center, ticket kiosks, automated ticketing booths and the main escalators. Space for retail will be provided along Natoma and Minna Streets as well as in Mission Square. The western end of Natoma Street will provide space for service and maintenance as well as for the Transit Center’s loading dock. An outdoor bus plaza will be located at the eastern end of the building between Fremont and Beale Streets, serving Muni, Golden Gate Transit, and SamTrans buses.